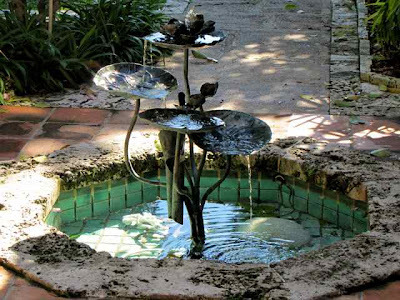 Today I visited a magical garden near Miami - The Kampong. 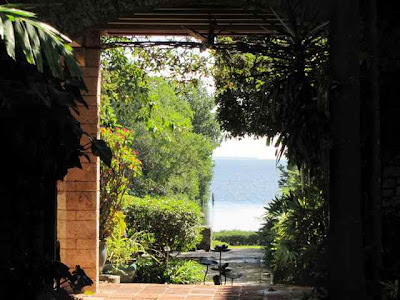 It's absolutely enchanting, has stunning views over Biscayne Bay and should definitely be added to your garden wish list if you're coming this way. Former home of Dr David Fairchild, the botanist who gave his name to the equally magnificent Fairchild Botanical Gardens (to be reviewed later this week). "Kampong" is a Malay word for a cluster of houses, and was adopted by the Fairchilds when they first moved to the property in Coconut Grove in 1929. Dr Fairchild was an avid plant collector and travelled the world in his capacity as head of the Office of Foreign Seed and Plant Introduction for the US Department of Agriculture. He also played an active role of the organization that was formed to promote the establishment of the Everglades National Park. His wife, Marian, was the daughter of Alexander Graham Bell, of telephone fame. When Marian died in 1962, some eight years after her husband, The Kampong was bought by Catherine "Kay" Sweeney, who was a well-established botanist in her own right. 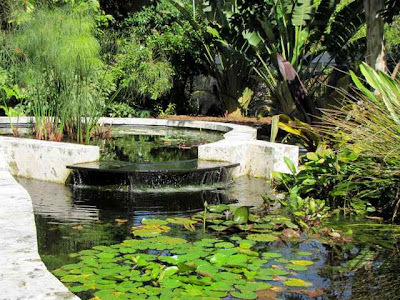 Called "Saviour of the Kampong" by the Miami Herald, because she saved the 11-acre plot from development, Mrs Sweeney hired horticulturalist Larry Schokman to manage the property. 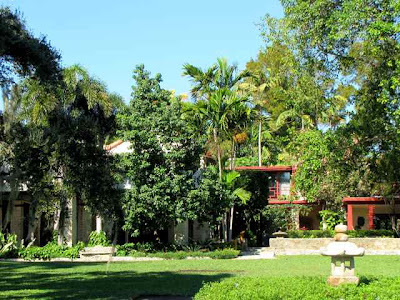 Kay Sweeney successfully petitioned for The Kampong to be placed on the National Register of Historic Places, which happened in 1984, and she then deeded the property to the National Tropical Botanical Garden (NTBG) based in Hawaii. 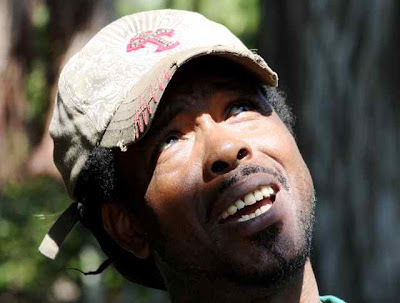 She lived there until her death in 1995, but worked closely with Larry Schokman to plant in the Fairchild spirit, and this tradition is carried on today by head gardener, Dunstan (pictured below) who trained with Schokman. There is no doubt that The Kampong is an absolute jewel and I was lucky enough to meet Dunstan while visiting. He showed me the trees and plants that make this place so special. But what really struck me was that the labelling was meticulous; the garden immaculately tended; and the number of new plants being introduced to compliment the existing plant stock. With this motivational spirit, the garden will surely thrive and I long to return in years to come to see how the new plants have fared under Dunstan's stewardship. The Kampong is open Tuesday to Friday, from 10.00 -2.00. Don't be put off by the notice on the gate which says that it's only open by appointment - drive in and check in at the house. 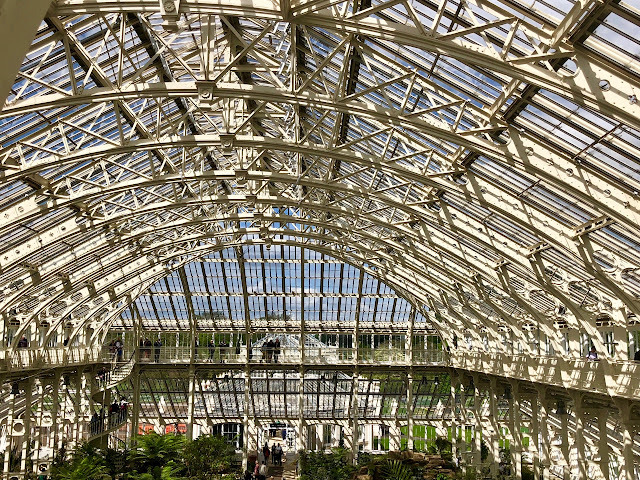 A self-guided tour is $15.00 per person and it's worth every penny. For reviews of all Florida gardens visited so far, visit my US Garden Directory. What a fascinating place. I read yesterday's post and today's about The Kampong. There are so many gardens and so little time, but I'm glad I can tour gardens through your blog that I may never visit. Thank you for sharing. Is that a Japanese Stone ornament I see there? Kampung is a common word in my place, where normally some of my friends go back to their hometown during weekends to visit their family. And speaking of kampung - its very much like a farm kind of enviornment where you will have chickens, livestock and in the midst coconut trees and other friut trees. A friend of mine comes back to the office with bananas, rambutans and other tropical fruits & vegetables. I guess this idea of kampong is very much tropical garden than the real deal? Dear Charlotte, What a wonderful experience. And just one more, for you appear to be having such a glorious and interesting time. Your account of this latest garden is fascinating. How fortunate that it fell into the 'right' hands after the death of its creator and now lives on under the careful stewardship of its Head Gardener. 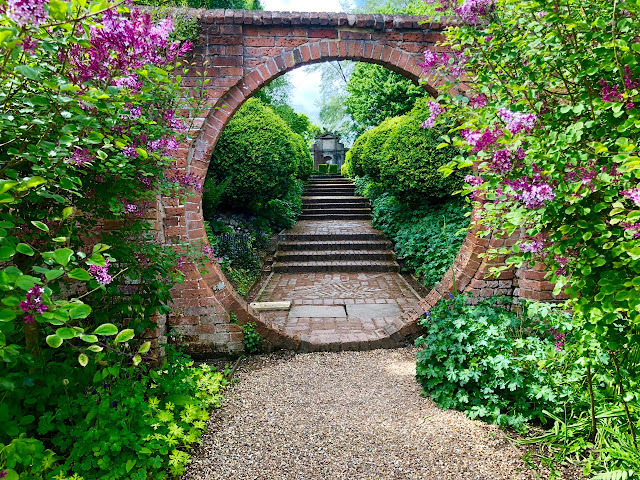 Hi Charlotte, thanks so much for describing David Fairchild's old garden, at least we have a glimpse of it. David Fairchild was responsible also for getting a lot of our Philippines Palm Trees to be introduced to the US at the start of the 20th century. I've just read it in books during college years. He has been coming over back and forth to the country for the lots of exotic palm trees he wants for the US. I wonder how big these palm trees are now, or maybe their descendants. Thoroughly enjoyed this account of the Kampong. Kay was my grandmother and I was fortunate enough to grow up at the Kampong, for a few years anyways. She called herself "a lady gardener" although she was really a well-established botanist as you say. She loved and cared for the property, always striving to make it better. Thank you for your kind words!